This summer, take an honest look at what seasonal benefits your company is offering your employees. Are you currently providing enough exciting company perks in comparison to other organizations? If not, it could be hindering your ability to retain workers and even source new talent. Deciding to offer your workers cool employee benefits speak a lot more to them than you’d think. It’s been found that 79 percent of employees would prefer new or additional benefits over a pay increase, per a 2015 Glassdoor survey. Furthermore, besides being an investment for employee retention, many companies are using their company perks to attract new talent. (And as we all know, attracting talent to your organization is no easy feat). There’s a lot of competition out there on what makes a company attractive to prospective applicants. Therefore, the good news is summer is a great time to strut what you’ve got. 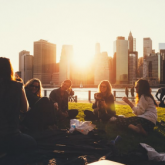 In the summer, many companies like to adopt specific, seasonal perks to help their employees feel appreciated and motivated while doing their job. Flexible hours: It’s no secret that summer is a distracting time of year for workers. With the beach, hot sun, and boardwalk calling their names, how could it not be? Thus, providing employees with the option to work flexible summer hours is an inexpensive, rewarding perk that companies commonly adopt. According to an article from Entrepreneur, a study by Opinion Research Corporation found that 66 percent of employees with summer hours perks even felt more productive at work as a result. Rest assured, this company perk will not only make current employees happy, but it will display to future applicants that you truly care about the work-life balance of your employees. Onsite amenities: Alas, there are some different ways to execute this idea in a way that works for your company culture. One example could be to offer free fruit and vegetable crudités to snack on in the breakroom. You could even offer dedicated days for certain food trucks to stop by during lunch hour. Want to get more involved with the community? Reach out to a local farm co-op to offer your workers with fresh vegetable pick-ups at work! This unique idea essentially hits two birds with one stone. Not only does this show you care about the community, but it cuts down on the time your employees will spend waltzing around the grocery store when they’d rather be parking it on the beach. Health programs: Ah, yes. Getting in shape to achieve the dreaded summer body can be quite the struggle. Sigh. While some companies have chosen to adopt weight loss challenge programs, it may not be entirely appropriate for every organization. If it works for your company, though - great! On the flip side, getting in shape for summer and improving overall health go hand in hand, right? Therefore, your organization can choose to have fun with this summer perk and personalize it in any way that works for you. Whether you choose to involve Fitbits, gym memberships, or competitions, it’s a sure way to make your employees happy this summer. Employees like feeling that their company is looking out for them. The summer is a great time of year to invest in the people that make you so great. You want the exceptionally talented people you hire to make you look good, and you can help attract more of them by making them feel good. At the end of the day, when employees are itching to get out of their seat and spend time with their loved ones this summer, just remember to treat them in a way that rewards them for all their hard work. As you grow as an organization, the company culture you continuously build over time through perks and benefits will speak loudly and appeal to applicants. Generally speaking, a positive work environment is very much desirable by most workers. By following the tips above, you can be well on your way to providing a happy summer working environment and attracting new applicants.